12/10/2017–MONROE, NC–On Saturday 11-12 November 2017, aviation enthusiasts from all over the Carolinas and other parts of the country came out on Veterans Day weekend to attend the annual city-organized airshow, Warbirds Over Monroe. The weather on Saturday was mostly cold with clear skies and brisk winds. But this did not prevent our CAP senior members and cadets from showing up to serve the public. CAP had members from NC-137, NC-121, NC-300 and NC-111. Visiting senior members from South Carolina squadrons also passed through. NC-137 took the lead in making the arrangements to secure a location, member passes and with the help of Lt Col Phillips the paperwork to be fully insured for the event. Lt Col Wilbanks and Capt Kimrey flew the CAP aircraft in the Friday afternoon prior to the airshow from the Concord Regional Airport to the Monroe Airport. Early Saturday morning the senior members from Group 6's NC-137 including Capt Merklin, Major Ovnic, Capt Gordon and 1st Lt Smith got the recruiting station set up before the city mandated time allowed. This included getting the aircraft ready with the generator in place and connected to the G1000 cockpit display. The aircraft operations were conducted under the direction of Lt Col Wilbanks. The Group 6 Commander, Lt Col Focke, started off the interaction with the interested spectators who came by to see CAP’s Cessna 182 and the G1000 display. Both the cadets and senior members did a great job in explaining flight controls and instrumentation to the kids and adults visiting. It was important to keep it all in layman’s terms so that visitors new to aviation could comprehend. The Cadets were very active in the success of both days. 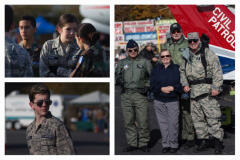 Cadets including C/CMSgt Bare, C/SSgt Purser, C/CMSgt Hurst, C/Amn Hornlein and C/SSgt Ross, were just a few who exhibited a great representation of what it means to be a CAP cadet. Many parents and kids gathered information at the CAP recruiting booth that was run by 1st Lt Patricia Allen and 1st Lt Dawn Stange, with the help of several parents. The well attended airshow began to slow down a bit on Sunday. The cadets and senior members alike continued to show the aircraft and its avionics to anyone who was interested. Others handed out contact forms around the grounds. At the close of the day, Lt Col Wilbanks and Maj Ovnic safely headed off with the CAP aircraft back to the Concord Regional Airport, while the other CAP members assisted in breaking down and packing up for the return home. It was another successful recruiting effort and one of the best opportunities we have each year to display and speak about what we do in CAP. Thank you to all those CAP members who attended and made this event possible.